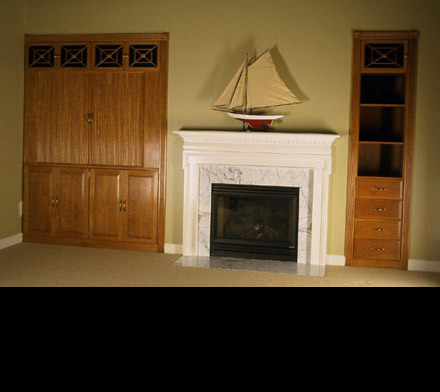 These built-in units were made for a couple that wanted a traditional look with doors that disappear when T.V. is in use. Due to the shallow depth of the cavity and the width of the T.V. pocket doors were not an option. The tambours disappear behind cabinet back so their not visable inside when open. Speaker fabric on top doors hide speakers and don't block sound. View of previous units showing doors open.